Sometime early last year I drew a strategy map of all the elements in a Software Defined Ecosystem for a client. OpenDaylight was just getting started and the need for open controllers was being discussed. 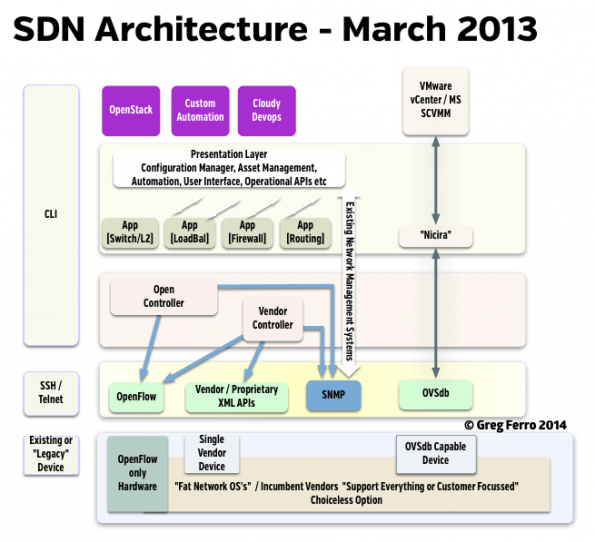 SDN Strategy Map 2013 – Click to embiggen. In 2014, the map looks different as the focus is shifting. Connectivity from the controllers and how to connect to the hardware is no longer interesting. startups are appearing that offer niche applications in security, WAN, optical and other network services. We have emergent strategies in the Portal, Monitoring and Analytics. I’ve left out other areas, still quite new. 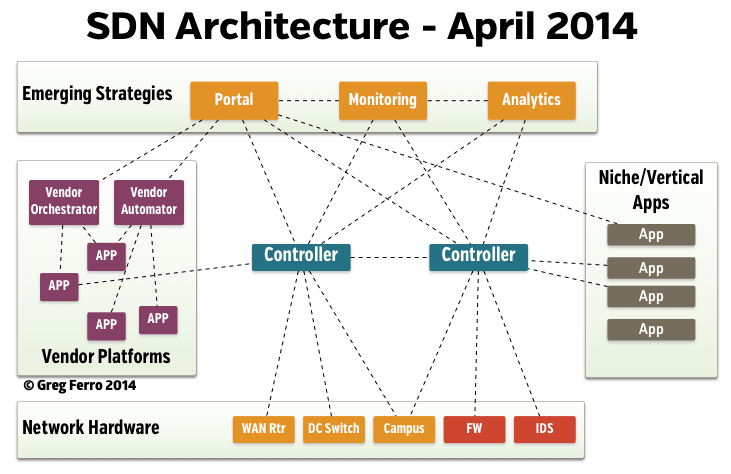 Current & Simple SDN Strategy Map 2014 – Click to Enrage. I’m struck by just how far SDN and the networking industry has travelled in the last 12 months. Today, most people are still buying data centre switches that use L2 protocols for reliability and redundancy but there are signs that purchasing is slowing dramatically as customers wait for SDN to mature. And SDN has grown from simply “Ethernet Switching” to include a wider range of devices including WAN, Security, Wireless, and Optical networking. This was predictable, of course, but its happened faster than I expected. At the same time, I don’t believe that real adoption or implementation will happen in the next 12 months. OpenDaylight has shipped Hydrogen as a developer version, not ready for production. Standards, both open, agreed or assumed, have yet to emerge. On the other hand, the future is becoming clearer.